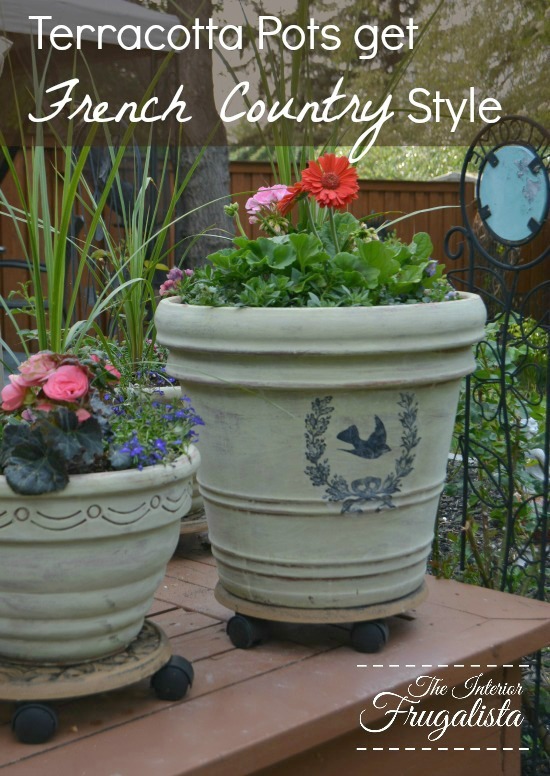 For years, I've admired the look of Vintage French Country pots. 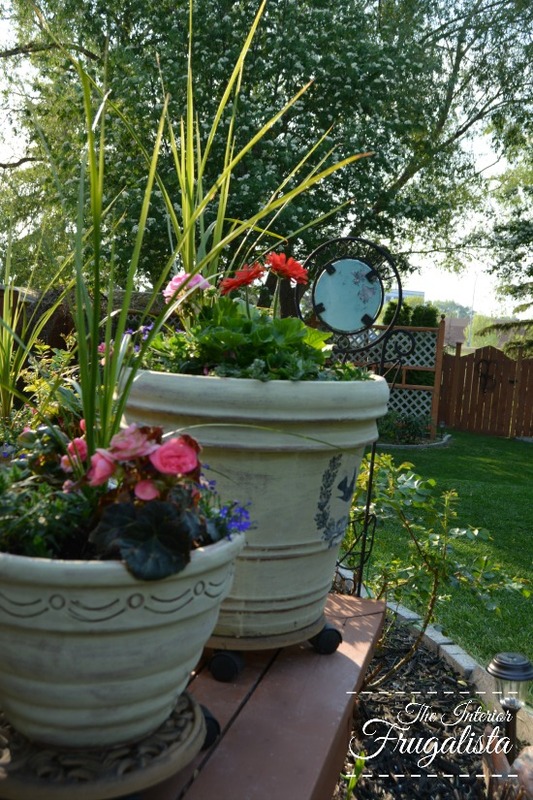 I've been pining for three large ones on the corner of our deck but the hefty price tag made that wish unattainable. 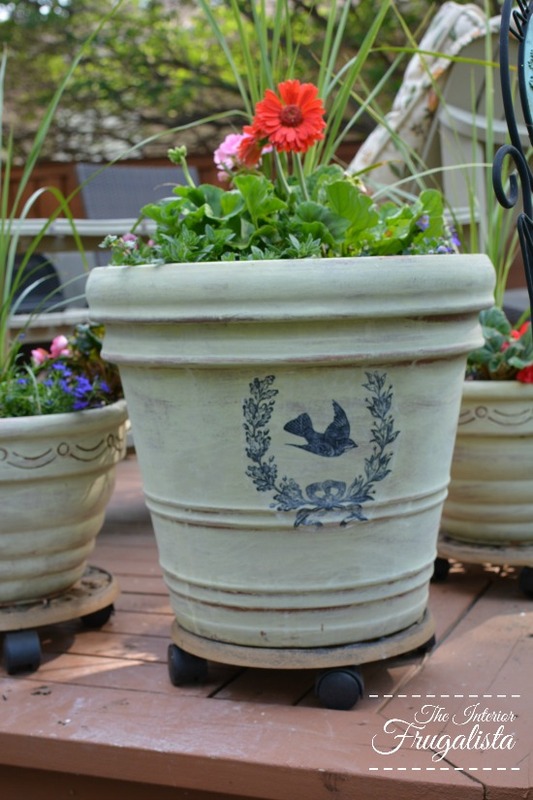 Chalk paint, a spray bottle, printer, and image transfer medium, my existing terracotta pots get French Country style! 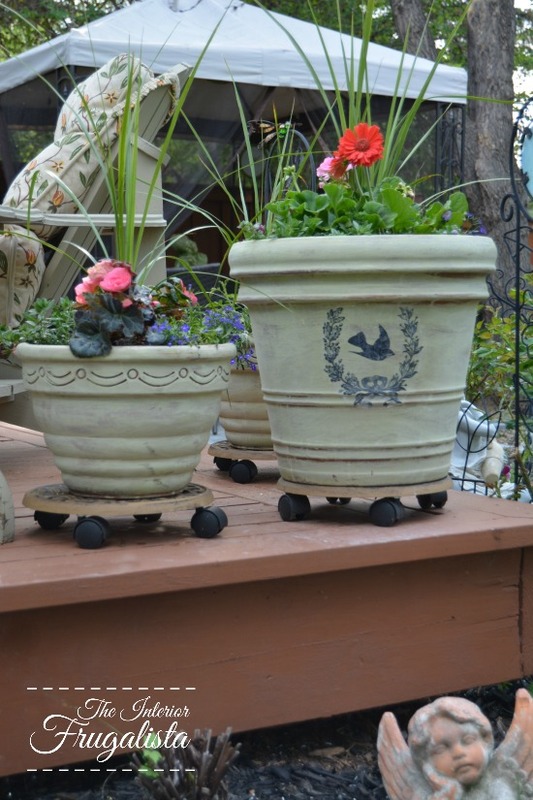 The inspiration for sharing my Terracotta Pots get French Country Style is a decorating challenge hosted in the Decorating and DIY Enthusiasts Facebook Forum. 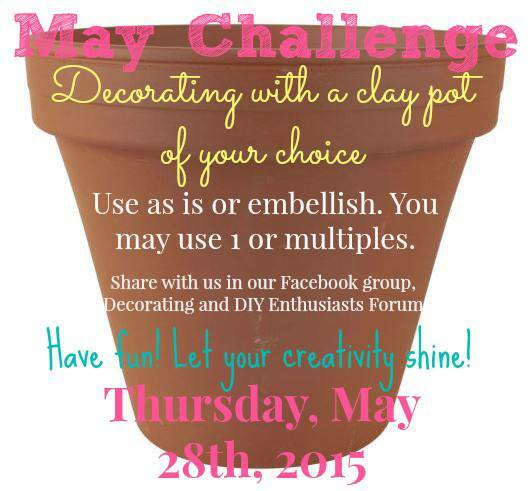 May's Challenge is Decorating With A Clay Pot and I'm so excited to be participating for the first time in this monthly challenge. All I did to create the look was water down some chalk paint in the color Versailles to the consistency of milk. 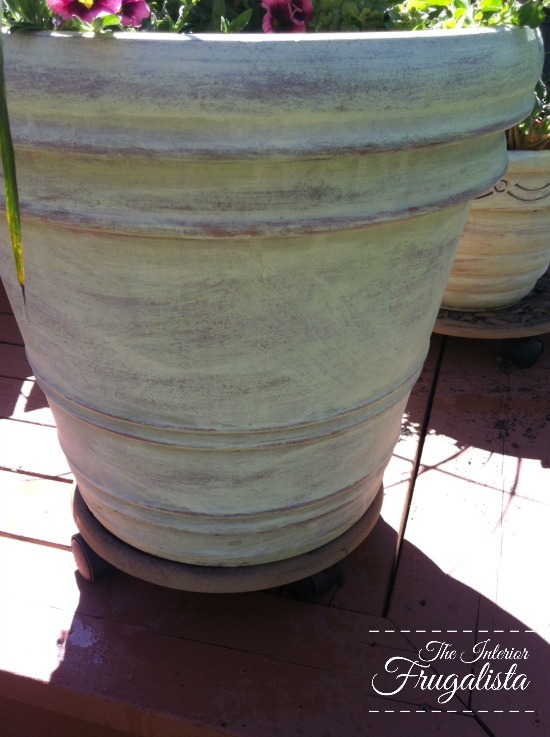 Randomly brush the paint onto your pots and let it dry to the touch. Using a spray bottle spritz the paint to dampen it and with a damp sponge remove (wet distress) the paint in some areas. That's it! 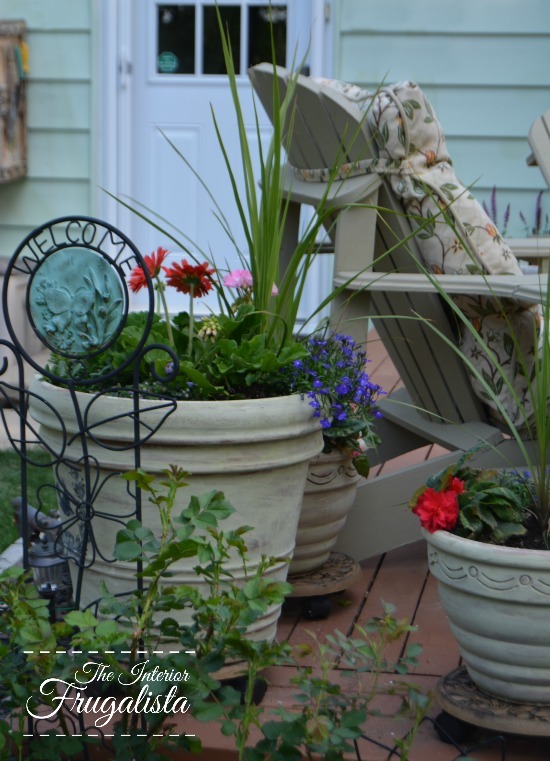 I didn't apply a protective finish because I want the paint to age naturally from the outdoor elements. 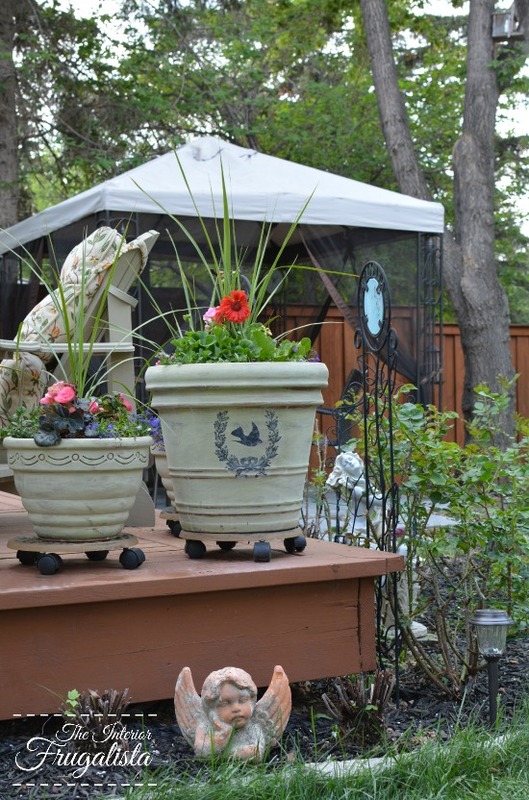 All three pots were painted late last summer and they withstood our harsh Canadian winter and still look fantastic! While I loved how they turned out, I wanted to add more French elements and so this challenge motivated me to apply the finishing touches. I went to the Graphics Fairy website and found the perfect French Typography graphic for the front of the largest pot. Using a laser printer, I printed the graphic in black & white on the "best" print setting. 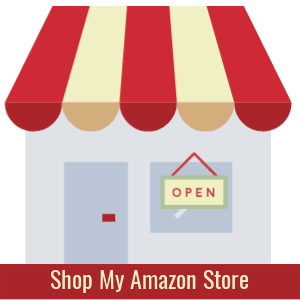 If your graphic has any text be sure to print a mirror image (reverse the image) before printing. Cut the white space around the image (as seen in the photo below). The closer you cut around the image, the less paper to remove later. 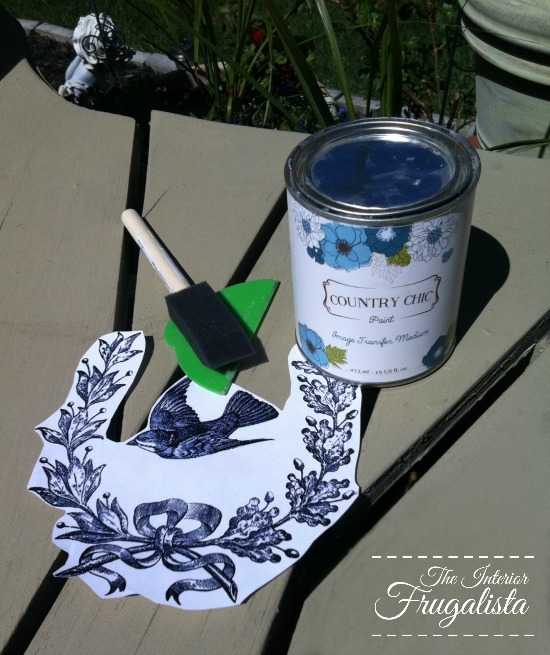 Using an Image Transfer Medium (my preference is the Country Chic Paint brand) but Mod Podge Photo Transfer Medium works well too, apply a generous coat with a foam brush onto the front (printed side) of the graphic. Carefully place the graphic onto the surface of your pot and with your finger or a plastic scraper (like the one pictured above) remove any wrinkles and air bubbles. Be careful not to move the graphic or it may smudge. Let it sit for several hours or overnight, until the paper the transfer medium is completely dry. Using a spray bottle dampen the graphic (not soak) and with your fingers or a clean rag gently rub until you remove ONE layer of paper. Let it dry and repeat this process until all the layers have been removed and only the ink remains. Tip: don't rub too hard or you risk removing some of the graphic. Like the paint, I didn't apply a protective finish over the graphic because I want it also to age over time from the natural elements. 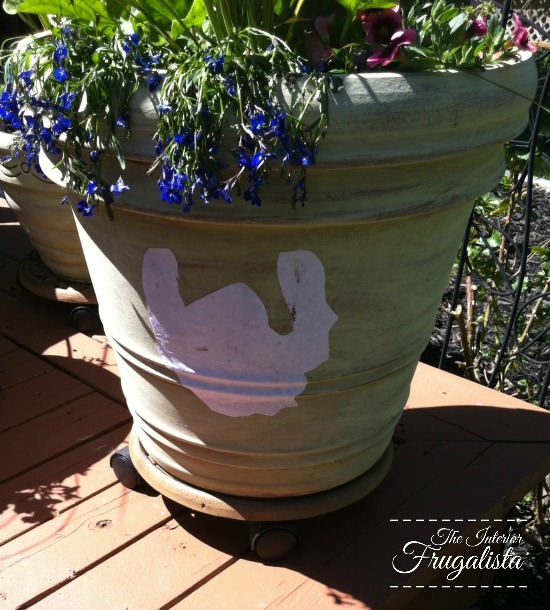 I was so happy to finally plant some flowers in these pots last weekend. Here in the Great White North, there is usually the risk of frost until after the May long weekend. 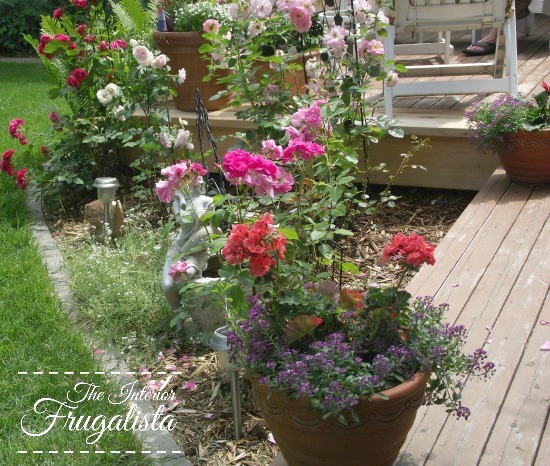 So while my flowers look scrawny right now, by mid-summer they should be filled with colorful blooms that cascade down my French Country pots. I'm thrilled with how they turned out and glad I resisted adding graphics to all three. 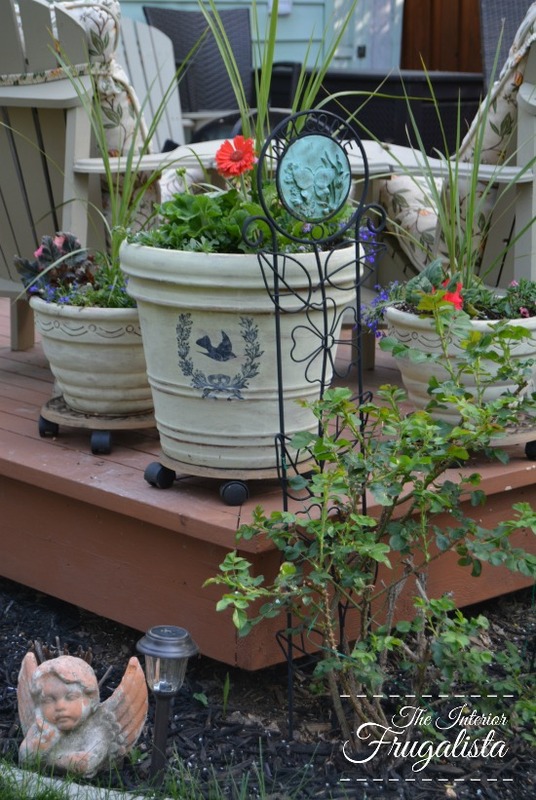 They look great with the Vintage Door Turned French Flower Planter we made last year for the deck. 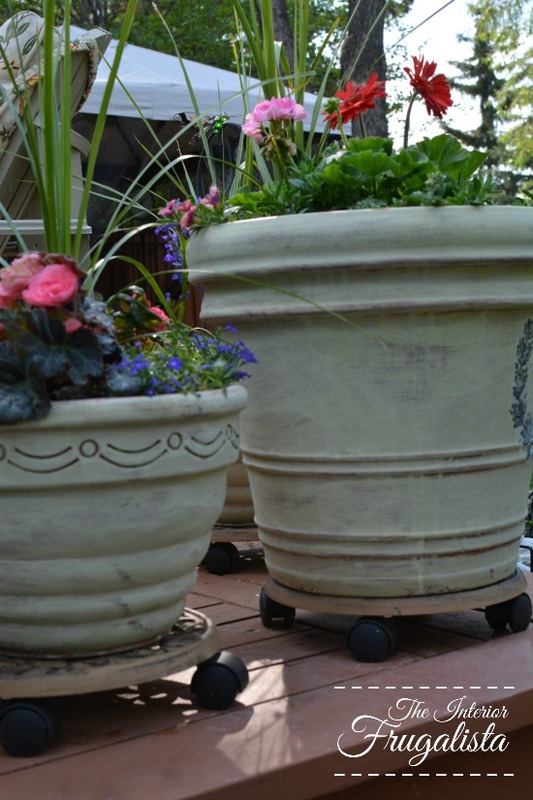 For another idea on how to Repurpose plant pots, visit my post Plant Pots to Water Fountain. 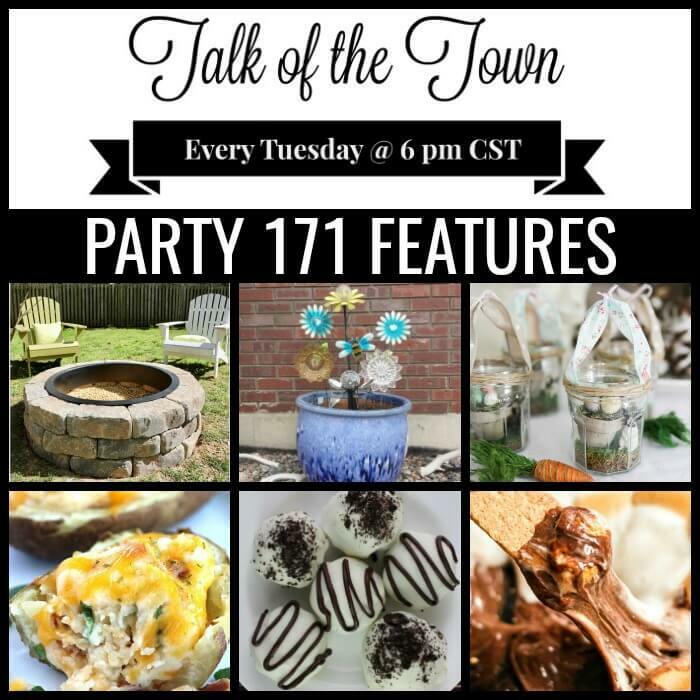 Be sure to visit the fabulous hosts and see what they did for the Clay Pot Challenge! 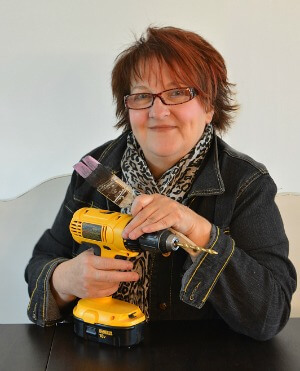 You'll find this project linked to these fabulous link parties. A big thank you to the following for featuring this project..